This month we take a look at the awesome Laura (Lou) Stevens, who is 29 from Twickenham in London and a very inspirational and active member of The Clubhouse. She is a brilliant example of how you can surprise yourself and go from non sporty to marathon runner. I love how she is always up for a challenge. When did you start running and why: I took part in my first event which was a Race For Life on 15th June 2014. According to my run keeper history my first training run was on 22nd May 2014 and to be honest between then and now there have been some very dry spells where not much running happened, but then some spurts of pure determination. 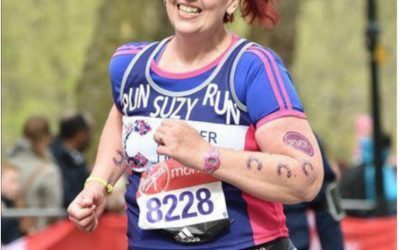 I started running because someone asked me to be in their race for life team, and after the race I wasn’t planning to keep it up. 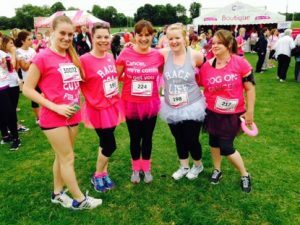 Then a close family member got diagnosed with cancer, and Race For Life became an important event to me and my competitive streak made me want to do better than the last. Did you run a lot when you were younger? I did not run a lot when I was younger, in fact very little at all, I used to cycle and I have always danced but running was not my thing. PE at school was not my thing – although I have a GCSE in it (not a very good one) but I never really wanted to take part. What do you love and hate about the sport of running? 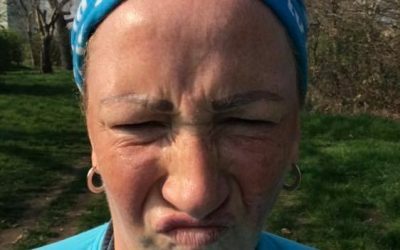 I’m going to start with the things I hate about running because that list is shorter, the early race morning starts, running in the heat and the stupidly long toilet cues at races! The things I love, the feeling of accomplishment, the places you see and visit that you wouldn’t normally go to, the people that you meet, the bling (I mean who doesn’t) The alone time that you can have while on a run, and the way that you can just clear your head and forget about the real world for a while. How often do you run? I now run about 4 times a week work permitting– however as you all know myself and Dianne from the club house ran every day in July and August has been equally active. Myself and my partner take part in a 100 mile a month virtual challenge, we run as a team so only have to actually achieve 50 miles a month each – but I’ve set myself the challenge of 1,000 in the year by myself. I’m currently on approx. 620 miles for the year, so I’m keeping my fingers crossed that I get there. What kind of distances do you run in training? When I first started running I’d go out for anything up to 3km, but now I make the rule that unless something drastic happens its always a minimum of 5km. I do three shorter runs and a long one a week, and I try and make sure that one run a week is run at negative splits to help me with speed training. Do you parkrun? I love parkrun, I work in theatre so luckily, I get to travel a lot for the job meaning I get to run at so many different locations. My home parkrun is Crane Park in London – it’s about 5 mins from Bushy park where Parkrun was founded but it has about 800 less people each week, so I like it. This weekend 27th Aug was actually my 40th parkrun and I’m aiming to complete my 50th on Christmas day. I have currently run at 16 different Parkrun’s and I have been lucky to meet clubhouse ladies at a few of these. We know you recently took part in a Marathon, could you tell us about your experiences with training, motivation etc. 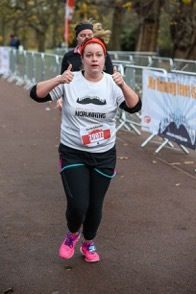 I took part in the Rock and Roll marathon in Liverpool, this however was not meant to be my first marathon. I was entered into Brighton earlier in the year. I followed the beginner to finisher training plan on Run Keeper and for the first time ever didn’t miss a session. Normally I don’t fully commit but I had a target, I wanted a sub 5hr and I knew I’d have to work so very hard to achieve it. I was on tour so I planned my runs around cities I didn’t know and on my Saturday long runs I ran to a parkrun, did it and then carried on my way. The week of my 20-mile training run I got a sharp pain in my shin… a trip to a physio later and I had a stress fracture and it was bye bye Brighton. 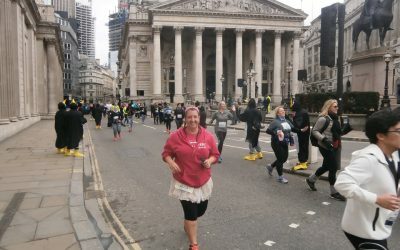 I wasn’t allowed to run for 3 weeks – Liverpool was something like 8 away and I did everything by the book, ice, rest, swimming, Epson salt baths, foam roller, other non-load bearing activities and managed to get myself to the start line. Id ran no further in recovery than 10km I knew my legs had the distance in them I just had to hope my mental will power could keep up. My other half ran the whole race with me and to be honest without him I would have crumbled, and he got me across the line in an amazing 5:03!! Granted he looked like he could have run the whole course again, he’s far speedier than I am, but I was so thankful that he dragged me round. You’ll all be happy to know I’m booked in for Brighton 2018… me and that race have unfinished business. 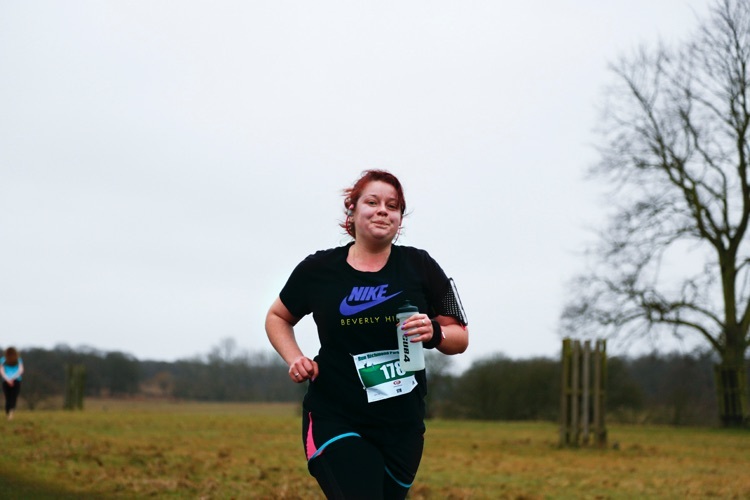 What are your biggest fears or hangups about being a plus sized runner? I always fear that someone will make a comment, but actually I’ve realized that my body has done some amazing things, countless 5 & 10km’s, 7 half’s and a full marathon, pretty sure the ones likely to comment have done nowhere near that. I used to worry about coming last but hay if that’s the case I’ll be making the most of the race fee. What is your ultimate running goal and what is stopping you from getting there? I really want to run the London marathon, and to be fair it’s the entry process that is stopping me, along with a whole load of us. 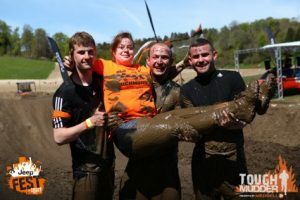 I also really want to do an ultra event, I didn’t think I could get my body round a full so I had never booked one but now I know I can I just need to check dates around the work diary. My job does make it hard to book events, well not to book them that part is easy but I never know when or where the work will be, and so far there has only been one race that I have booked that I can’t attend anymore. 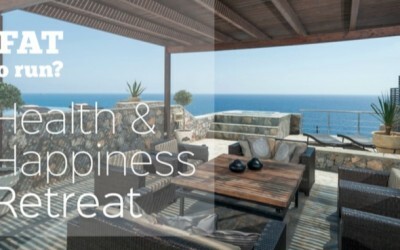 What’s more important to you and why? Frequency, running or distance of running? I think the frequency of running is more important for me, I don’t always have hours of time to go out and run for but I always think that something is better than nothing. Keeping the activity up, keeping the muscle memory going and sheer determination will help do the rest. What could the government, local authorities, sports clubs etc do to encourage more people to take up running and sport, especially overweight and inactive women? Parkrun had played a big part in getting people active, but more can always be done and the clubhouse is proof of that, local fun runs and just more publicity of community running clubs would be a start. What are the biggest barriers for plus sized women? Clothing that fits is one of the biggest barriers I find, I need to be comfy when running and finding bottom halves I like is a massive challenge. What would you say to other runners just starting out? 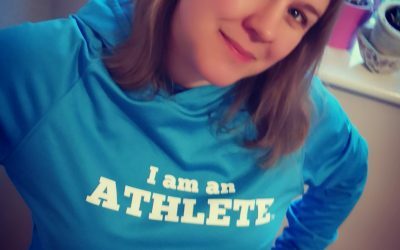 I heard a woman behind me at parkrun this week say, “I’m just not a runner” ladies I know you are all with me when I say we may not look like you stereotypical “runner” but that is exactly what we are, and anyone can be! We come in all shapes and sizes and varying speeds. Like everything else it’s not going to be easy to start with in fact my first 5km was the hardest thing I’d ever done, but then so was the first 10km, the first half and then the first full, but with each increased distance that was harder the shorter ones became easier. I love running and I won’t be representing England anytime soon but if you enjoy it stick at it cause the human body is amazing and it will help you do things you never thought you could. What have you learned about yourself through running? I have learnt that I’m capable of more than I ever thought. I’ve shocked myself from becoming the girl who hated PE to a marathon runner, and I’ve learnt that finishing any race warrants a nice cold beverage in celebration. If you join The Clubhouse before the 1st September you will receive one of our TFTR headbuffs worth £14.99, find out more here. We are currently planning for the 2018 spring race calendar and preparing for our first international road trip to Euro Disney.